The Ministry of Economy of the Republic of Lithuania is a member of the Steering Group of PA Tourism. EU member states as well as non-EU member states are partners in the EU Strategy for the Baltic Sea Region. The 11th Baltic Sea Tourism Forum will be held in Riga, Latvia. Currently there are no upcoming events available. The second week of the third call has just started. Applications are accepted until 27 February. The Swedish Institute opened a new seed funding call, which is open until 01 February 2017. The Steering Group of policy area tourism has agreed on an updated version of the Terms of Reference (ToR). The Interreg South Baltic Programme has announced their second call decisions. The Interreg Baltic Sea Region Programme secretariat opened the first seed money call in the frame of the EU Strategy for the Baltic Sea Region. The EU Strategy for the Adriatic-Ionian Region met for their first Forum on 12-13 May 2016 in Dubrovnik, Croatia. On 9 March 2016 the organisation team of this year’s Baltic Sea Tourism Forum (BSTF) met at the ITB in Berlin. 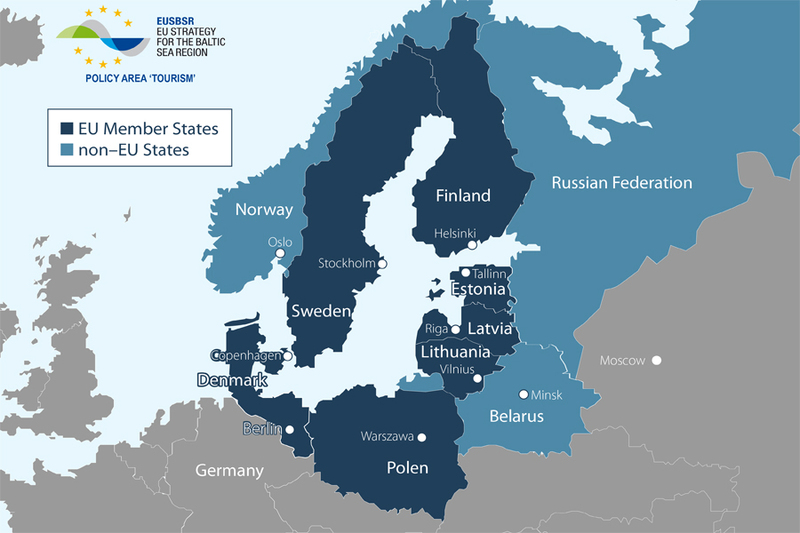 The 2nd call of the Interreg Baltic Sea Region is open since 1 March 2016. During the 4th EUSBSR seed money round, which was closed on 18 February 2016, 28 out of 45 seed money project applications were approved. PA Tourism participated in the seminar and introduced their work to national coordinators in the frame of a presentation. The fourth call for EUSBSR seed money applications closed on 30 October 2015. In total, the Seed Money Facility (SMF) received 50 applications. On 22 and 23 September 2015 the 8th Baltic Sea Tourism Forum was held in Gdansk, Poland. Please note that a registration for the 8th Baltic Sea Tourism Forum is possible only until 14.09.2015. The Policy Area Tourism Coordinator Team presented the EUSBSR and PA Tourism during the 24th BSPC with a stand. The 6th Annual Forum took place from 14th to 16th of June 2015 in Jurmala (Latvia). The revised Action Plan will be presented at the 6th Annual Forum of the EUSBSR (15-16 June 2015, Jūrmala, Latvia).